An update on the work will be provided at the meeting as well as a discussion of future initiatives. Natural Gas: The Second-Best Fuel? 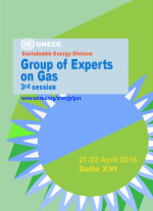 How does gas fit in a sustainable energy future? Item 5: Overview of the activities of international organizations in the field of gas. Tour de table: recent developments and medium- and long-term prospects and policies in the gas industry – country updates.